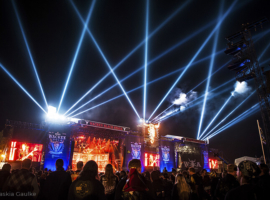 August 2014, Wacken, Schleswig-Holstein – For the 25th anniversary of its inception, the bright beams of FALCON searchlights pointed the way to the world’s biggest heavy metal festival. Commissioned by PRG AG, A&O Technology supplied the FALCON BEAM 7,000W searchlights. These were integrated to spectacular effect by lighting designer Jerry P. Appelt into the overall picture. The Bull’s Skull was in flames. Above it, beams of light fanned outward and upwards into the night sky. 75,000 fans cheered their bands. 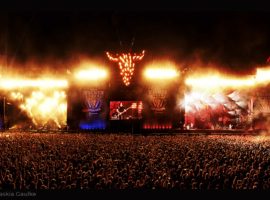 Motörhead, Slayer, Metallica, Megadeath and Saxon were just 4 of the 132 acts performing live this year in which the Wacken Open Air celebrated its 25th birthday. For the heavy metal cult festival, which lasts several days, lighting designer Jerry P. Appelt had more that two dozen FALCON BEAM 7,000W searchlights installed on the main stage. From there, the tracer lights, arranged into three groups of six, supplied coloured highlights, fanned outward and upwards into the skies and discharged again and again their electronic strobes in a dry staccato – ever faithful to the motto “Faster – Harder – Louder”. The FALCONs were installed on the True Metal Stage and the Black Stage that alternated in the role of main stage. Between them was the Bull’s Skull, the emblem of the WOA. The searchlights, positioned on the wings and at the centre, emphasized the main stage, which extended over more than 40 square metres. Parts of the concert were broadcast live on television. 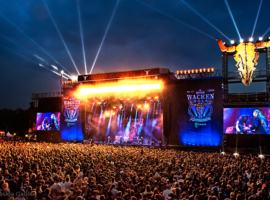 The Wacken Open Air is regarded as one of the Germany’s most important music festivals. A third of the fans – known as ‘metalheads’ – who attended the 40th Wacken Open Air Festival came from outside Germany. 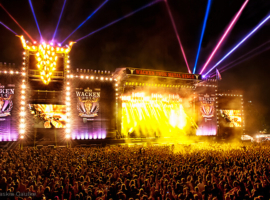 The 75,000 tickets for the Wacken Open Air 2015 sold out in 12 hours. A new record.